The Magnuson-Stevens Fishery Conservation and Management Act, or MSA, is a landmark piece of environmental legislation that led to significant conservation gains in the Gulf of Mexico. While the Clean Water Act and the Endangered Species Act get all the glory in the arena of environmental laws, the MSA (which has been in place since 1976) has worked steadfastly to ensure that Americans have continued access to fish and that marine ecosystems stay healthy and resilient. Here’s three fisheries success stories emanating from the Gulf, reminding us as the MSA turns 40 this year that it’s a keeper. Some like it fried. Some blackened. Some broiled with a squeeze of lemon. No matter how you take it, red grouper is legendary both for its place on the dinner table and for its fight at the end of a fishing line. Because of the protections put in place for reef fish under the MSA, red grouper should continue to thrive for generations to come. It was declared rebuilt in 2007, meaning that the stock is currently safe from overfishing, and that wild populations are thriving. This is great news where I live on the west coast of Florida, as the fish provides great fishing opportunities for charter, commercial and private recreational fishermen and is a strong indicator of sustainability in reef ecosystems. Red snapper is the most iconic fish of the Gulf of Mexico. Its delicate, flaky, white flesh makes it a favorite of shoppers at the fish market, recreational fishermen out on the water, and gourmands at white table cloth restaurants across the nation. Although the recovery of Gulf red snapper is well underway, it is a story that has been peppered with challenges. 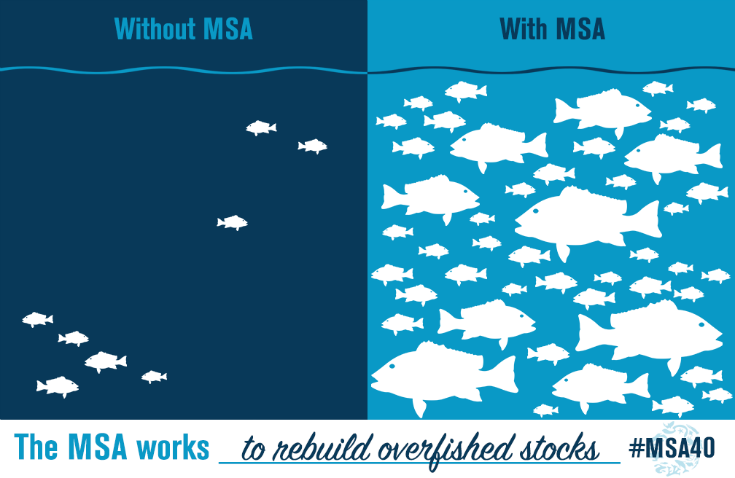 Historical overfishing led to the stock being placed into an MSA-mandated rebuilding plan in 1990. Since then, rebuilding has been extremely successful—so much so that 2014 marked the highest allowable catch levels ever authorized by Gulf fisheries managers, a whopping 14.3 million pounds of fish. Provisions in the MSA held commercial fishermen accountable for every red snapper they catch, meaning they do not exceed their share of the quota and rebuilding remains on track. Similar MSA-authorized provisions are in the works for the charter for hire fishery, and ultimately the MSA can give greater accountability to the private recreational component of the fishery as well. King mackerel, or kingfish, was declared rebuilt under the MSA in 2008. This was welcome news for this popular sportfish that makes for a fun day of fishing and for a delicious bounty for the smoker. Kingfish are travelers: They generally spend the summer months in the northern gulf, with two separate populations heading southward in the fall along the Florida and Texas coasts, and return to the Northern gulf in the spring. Their predictable migratory routes make them reliable and celebrated fall and springtime targets for Gulf fishermen. When I see them show up year in and year out, I know it’s because of MSA protections that have ensured the stock is healthy and sustainable. Take action to protect the future of America’s fisheries.